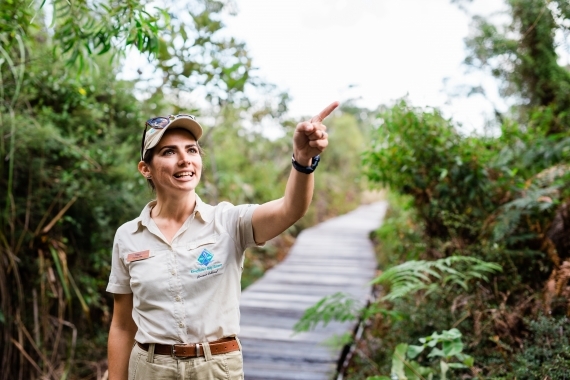 Join our Rangers on a guided one-hour nature walk and discover a bunch of things you never knew about the world's largest sand island. From native history and storytelling to the crazy creatures that come out after dark - there's something to learn about at every track and turn. K'Gari, meaning paradise, is the Aboriginal name for Fraser Island. Learn about Butchulla legends and culture. See midden remains in the sand dunes, discuss the legend of Fraser Island's formation, taste bush tucker, and learn about the roles of men, women and children in Aboriginal clans. Fraser Island is home to 354 species of bird. Some migratory species come from as far away as Siberia. Join our Rangers as they teach the basics of bird watching. Learn when and where to find some of Fraser Island's bird life. Kingfisher Bay Resort has set benchmarks in ecotourism. The resort's architectural design, infrastructure and activities minimise the effects on the environment, conserve energy and minimise waste. Come behind the scenes and see how we operate our sewerage treatment plant and how our worms help us recycle. On Fraser, our bush provided foods and medicine for both the Butchulla and early European settlers. Learn how to identify this rich source of Australian food and find out how it can be used in every day life. There are also opportunities to touch, smell and taste the flavours of the Fraser Island bush. Put on your sensible shoes, bring a torch and join the search for our fabulous nocturnal neighbours. See insectivorous bats socialising and feeding around the resort lakes; turn the spotlight on sugar gliders as they move from tree to tree; learn about the stars in the southern sky. You'll also hear the rare acid frogs of Fraser Island and learn how they have adapted to survive. At every low tide the inter-tidal zone emerges as the water recedes and the sand flats become land. This area is home to many wonderful creatures that survive the tidal change from sea to sand. Walk along the beach towards McKenzie's Jetty - an old logging site. You'll be surprised at the variety of animals and plants that inhabit this zone. 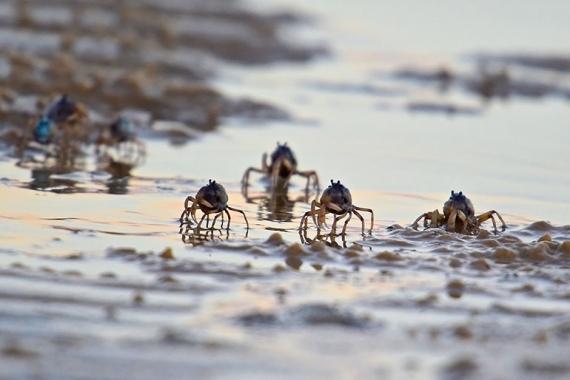 Dundonga Creek has a fascinating mangrove colony, which plays a vital role in sustaining the marine ecosystem. There are eight mangrove species in this one area. On this walk (or guided canoe paddle if you prefer), you'll discover how mangroves differ form other plants; find out how they adapt to a salt environment and learn about the sands of the North White Cliffs and their significance in the island's formation. Walk through the mirror lakes and wallum heath that front the resort. On this walk you'll learn about the link between the animals and plants in this area and look at the vital role fire plays in a wallum community. The Berrillbee walk takes you through the open forest and different plant communities within a coo-ee of the resort. 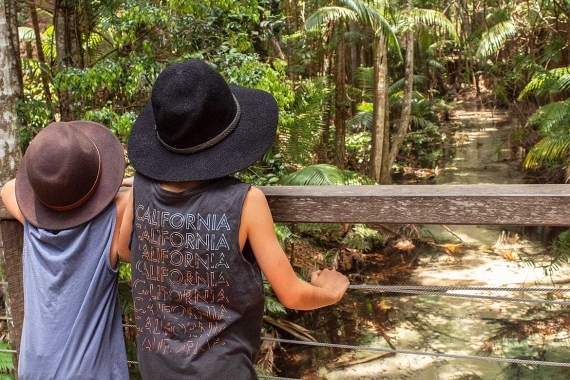 It's a great way to learn about the logging history of Fraser Island and hear the old logging yarns as you crest the natural sand amphitheatre that protects the resort. The views on this walk are superb - as you look out across the smaller sand islands of the Great Sandy Strait towards Hervey Bay and discover how Fraser Island formed. It's not unusual to see dolphins frolicking, dugong feeding on the seabed or the odd migrating Humpback. You'll walk through open forest and discover the flora and fauna that thrive in this environment and how they grow completely in sand. See the spectacular beauty of Fraser Island and marvel at the diversity of life and scenery. You'll see spectacular wildflowers, dingoes, lizards, echidna, snakes, birds of prey, Humpback whales, dolphins, dugong and rays. Learn about the flora and fauna and find out why there are no koalas, kangaroos or emu on the island. We have a range of educational programs available or we can work with you to tailor one to suit your needs.